On a tight and technical track at the Caja Magica stadium in Madrid, Cody Webb enjoyed a strong start to his evening by posting the second fastest time in the SuperPole qualification lap. Aiming to add to his overall win from the previous round in Germany, the American rider made a solid start to race one. 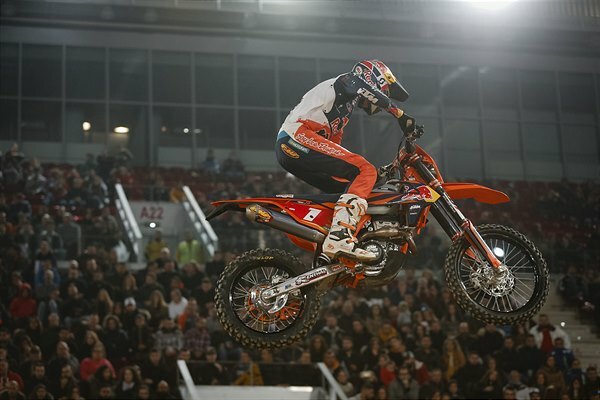 Following a small mistake that cost him some time, Webb regrouped and worked his way through the field of riders. At the end of the gruelling 10-lap race he crossed the line in third. With another good start in the third and final heat, Webb moved into second place early on. Riding his way up onto the wheel tracks of race leader Colton Haaker, he began to set himself up for an overtake. Unfortunately, a technical issue on lap four forced Webb to stop and make trackside repairs to resolve his issue. Despite his best efforts to rejoin the race, he wasn't classified as a finisher. Cody ended his night as the overall runner-up. 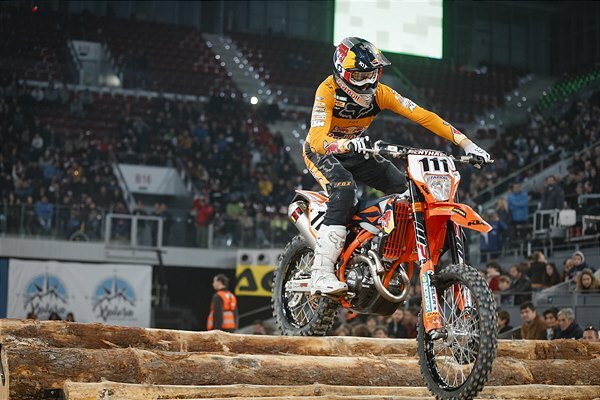 For Taddy Blazusiak, the third stop of the SuperEnduro series was challenging due to a series of crashes that ended with an injury to his knee. Entering the Madrid event second in the championship chase, the KTM rider was eager to regain control of the points lead. Third fastest in the SuperPole showed the Polish rider was on form and hungry for success. Putting in a clean ride in the opening race, Blazusiak raced hard for a confidence-boosting second place. Knowing the reversed start order for race two would play a factor on the tight course, Blazusiak was unable to avoid trouble on lap one. Remounting last he battled hard to climb his way up to fourth. However, in a fight to the finish line for second the KTM rider crashed heavily and was unable to finish the race. Determined to make amends, he looked to take the holeshot in race three. But on catching his foot in a hole exiting the rock section, he injured his left knee in the process. Needing some time to assess the situation he valiantly rejoined the race and scored valuable championship points with 12th, ending his night ninth overall. The 2019 FIM SuperEnduro World Championship continues with round four in Budapest, Hungary on February 9, 2019.